Bespoke, handmade rugs for commercial and public spaces. Loophouse works hand in hand with your interior designers and architects on your design and build projects to create a truly unique, eye catching centrepiece. 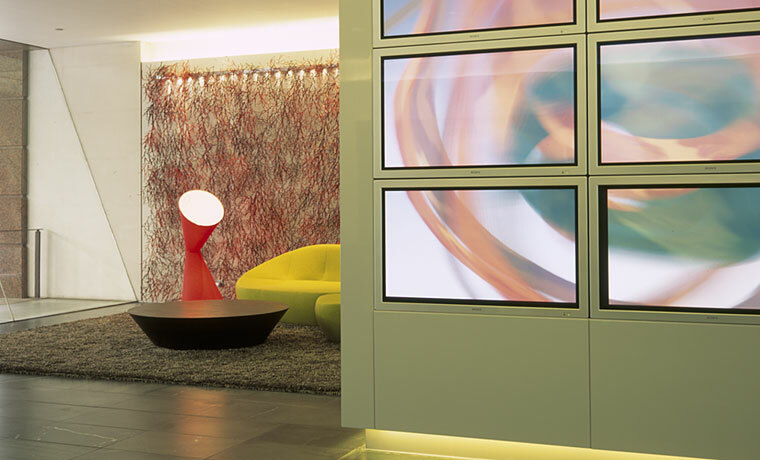 An impressive reception area is the first physical impression that you present to your clients. Loophouse can provide a focal point for these areas with a bespoke made rug, providing a prestigious feel and maintaining your company's brand image. This brand identity can be expressed through colour, design essence and relationship to the environment. With extensive experience in the design and build sector, Loophouse works with practiced efficiency, and is able to hit your deadlines and meet your specific site requirements. Our unique service is a combination of design expertise with superior materials and production facilities. We deliver custom rug solutions to answer any brief. Interior Architecture and Design Practice WISH London commissioned loophouse on behalf of CIT Group PLC. Sited in the reception of this landmark building is a perfect example of a loophouse, bespoke rug designed to work in harmony with its surrounding interior space. This handmade rug, with its elegant and subtle colour gradation detailing, divided by a subtle 100% silk accent band creates a serene platform for the seating area, co-ordinating with the surrounding furniture and artwork. Photography courtesy of WISH London. 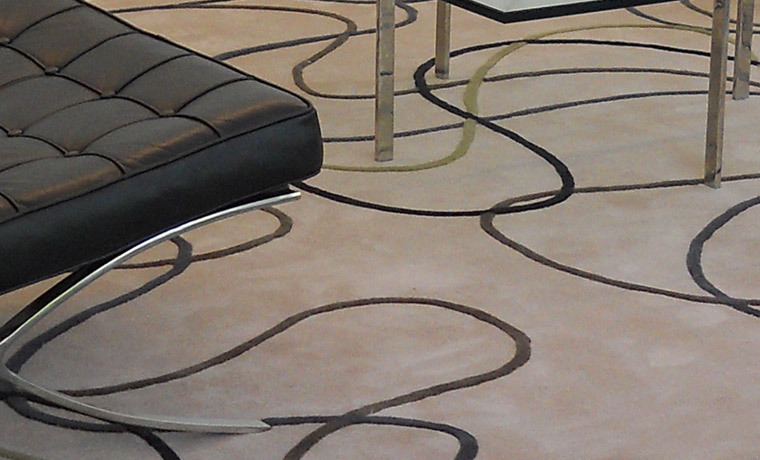 The cutting edge design of this spectacular reception area sited six modern and textural loophouse rugs. The subtly of colour and texture play an important role in the choice of loophouse rugs for this space. Defining the six seating areas, five of the rugs present a sharp minimal approach where low cut piles enhance solid hues. In contrast a large FeltV40 rug plays on exuberant texture and extravagant pile heights. Positioning of the loophouse rugs within this contemporary interior reconfigured the 421 MT SQ atrium to impress any visitor - whether on entrance or from it's 6th floor balcony. The impressive K&L Gates Center worked with NEXT Architecture and Designtex to provide a beautiful loophouse custom made rug for the main lobby of this prestigious Pittsburgh Building. The Eliza design, chosen from our signature collection Hidden, brings warmth and a perfect focal point to their streamlined and contemporary reception area with its Mies van der Rohe chairs. Great loophouse installs for T. Rowe Price, located in the reception areas of their offices in Hong Kong, Sydney, Zurich and Baltimore HQ. In Hong Kong the simplicity of the DewDrop design from the Woodland collection uses an understated palette enhanced with a pop of blue to co-ordinate with the chair fabric and accents of blues seen in the surrounding furnishing. The base of this rug has the appearance of an additional texture through the use of our sophisticated 'striation' application - making it a truly unique custom made area rug. For Sydney the custom design with Aboriginal influences picks up on similar colour palettes as above. Again, this rug uses our 'striation' technique in it's base to create depth and the appearance of texture. Custom design in collaboration with Gensler and Designtex. 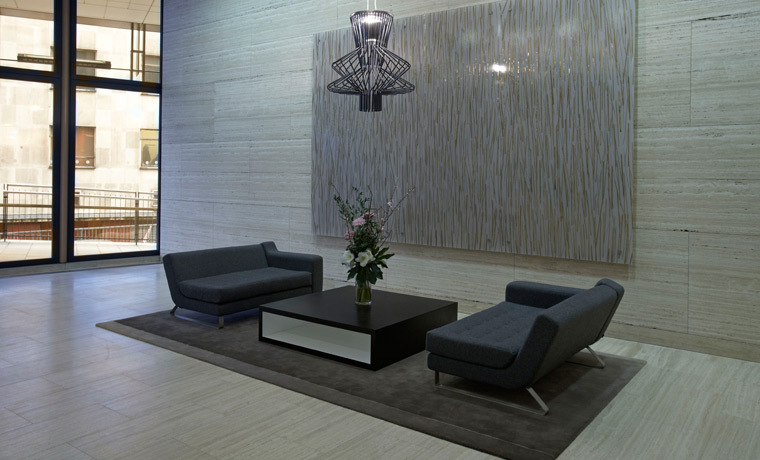 Three loophouse rugs are sited in the reception area of the celebrated One London Bridge building. The design, taken from the loophouse Singular Forms Collection, integrates seamlessly with their surroundings. The designs mirror reflections in the windows and grid formations within the architecture and, coupled with the Mies van der Rohe 'Barcelona' chairs, create intimate seating areas.